Avoid any additional trauma to your head—don’t engage in any activity that carries a risk of head injury. Limit activities of all kinds, including school and work. Concussion is a brain injury that occurs when the brain is shaken inside the skull, causing changes in the brain’s chemistry and energy supply. A concussion might happen as a result of a direct blow to the head or an indirect force, such as whiplash. You might or might not lose consciousness. There are many symptoms related to concussion, and they can affect your physical, emotional, and mental well-being. Concussion is easy to miss because diagnostic imaging, such as such as magnetic resonance imaging (MRI) or a computed tomography (CT) scan, usually is normal. Because of the variety of possible symptoms that can interfere with day-to-day activity, seek coordinated medical care immediately. Your health care professionals may include a physician with expertise in concussion, a neuropsychologist, and a vestibular physical therapist (a physical therapist who specializes in treating balance disorders and dizziness). After a concussion, limit any kind of exertion. The brain won’t have time to heal if you increase physical exertion too soon—such as returning to social activities or sports—or if you increase cognitive demands too soon, such as returning to school or work. You can slowly resume normal activities only once your symptoms have improved and stay improved. Physical therapists can evaluate and treat many problems related to concussion. Because no 2 concussions are the same, the physical therapist’s examination is essential to assess your individual symptoms and limitations. The physical therapist then designs a treatment program. If you have dizziness or difficulty with your balance following a concussion, vestibular physical therapy may help. The vestibular system, which includes the inner ear and its connections with the brain, is responsible for sensing head movement, keeping your eyes focused when you move your head, and helping you keep your balance. A qualified vestibular physical therapist can provide specific exercises and training to reduce or stop dizziness and improve balance and stability. Your physical therapist will examine you for neck problems following a concussion. Neck injuries can cause headaches and contribute to some forms of dizziness. Your therapist also can assess your back for possible injuries to your spine. As symptoms due to concussion improve, your physical therapist will help you resume physical activity gradually, to avoid overloading the brain and nervous system that have been compromised by concussion. It’s important that you follow the recommendations of all health care professionals so that you can achieve the greatest amount of recovery in the shortest amount of time. You’ve just come home from a soccer game where your 15-year-old daughter was star goalie. She admits to you that she “dinged” her head during a play in the second half and did not tell anyone. She’s complaining of headache and dizziness, and she’s sensitive to light. During the next couple of days, she’s frequently in the nurse’s office due to headaches and dizziness. She reports difficulty concentrating and remembering during school and is having trouble falling asleep at night. What do you do next? Have the concussion evaluated by a licensed medical professional with expertise in treating concussion. Some communities have concussion or mild traumatic brain injury clinics. Evaluation should include an assessment of symptoms, neurologic screening, testing of thinking ability (“cognition”), and testing for balance problems. Do NOT allow your daughter to participate in sports or any other activity with risk of head injury until she is cleared by a licensed medical professional with expertise in treating concussion. Repeated concussions can result in many problems. Do NOT allow your daughter to engage in physical activity—such as exercise, sports practice, gym class—until she has recovered from her concussion or has been advised by a licensed medical professional with expertise in treating concussion. Physical activity during early stages of concussion robs your brain of the energy it needs for healing. Limit thinking (“cognitive”) activity until you have recovered from your concussion or have been advised by a licensed medical professional with expertise in treating concussion. Your brain requires additional energy to heal from a concussion, and excessive thinking interferes with recovery. Get plenty of sleep and rest. This will help your brain to recover from the concussion. A physical therapist who is experienced in treating people with neurological problems. Some physical therapists have a practice with a neurological or vestibular rehabilitation focus. When you contact a physical therapy clinic for an appointment, ask about the physical therapists’ experience in helping people with concussion. The following articles provide some of the best scientific evidence related to physical therapy treatment of problems related to concussion. The articles report recent research and give an overview of the standards of practice for treatment both in the United States and internationally. The article titles are linked either to a PubMed abstract of the article or to free full text, so that you can read it or print out a copy to bring with you to your health care provider. Alsalaheen BA, Mucha A, Morris LO, et al. Vestibular rehabilitation for dizziness and balance disorders after concussion. J Neurol Phys Ther. 2010;34:87–93. Article Summary on PubMed. McCrory P, Meeuwisse W, Johnston K, et al. Consensus statement on Concussion in Sport 3rd International Conference on Concussion in Sport held in Zurich, November 2008. Clin J Sport Med. 2009;19:185–200. Article Summary on PubMed. Ever considered Physical Therapy for women’s health issues? Our Women’s Health Specialist Brie is dedicated to providing comprehensive care to her patients. Read more about what Physical Therapy can do for Women’s Health. Women’s health issues such as urinary incontinence, osteoporosis, chronic pelvic pain, and pregnancy related pain can all be intimidating. Perhaps it is the lack of information and understanding of what’s going on in their bodies that makes women anxious about these issues. Or maybe it is the very personal and private nature of their diagnosis or symptoms that causes women to avoid treatment. It is very likely many women don’t even know that these problems can be very successfully treated with physical therapy. We want to spread the word. It doesn’t have to be scary! We are here to help. During your initial visit, your women’s health physical therapist will take the time to get an in depth understanding of your symptoms and their history. She will also explain the physical therapy treatments available to you and address all of your concerns about this type of physical therapy intervention. During all of your visits, your women’s health physical therapist will apply many of the same physical therapy treatments used for other parts of the body in order to help address your symptoms. These include patient education, muscle re-training, soft tissue work, and exercises. Our women’s health physical therapist is able to address all musculoskeletal contributions to the particular symptoms you are dealing with since she treats general orthopedics in addition to having specific training in treating the issues specific to women’s health physical therapy. Brie Oneal, DPT, graduated from the University of Washington with a BA in Business Administration and a concentration in Accounting. She later returned to school to follow her passion in physical therapy and graduated with a Doctorate in Physical Therapy from Eastern Washington University. Since graduating she has been practicing in the Seattle area focusing in manual therapy and outpatient orthopedics. 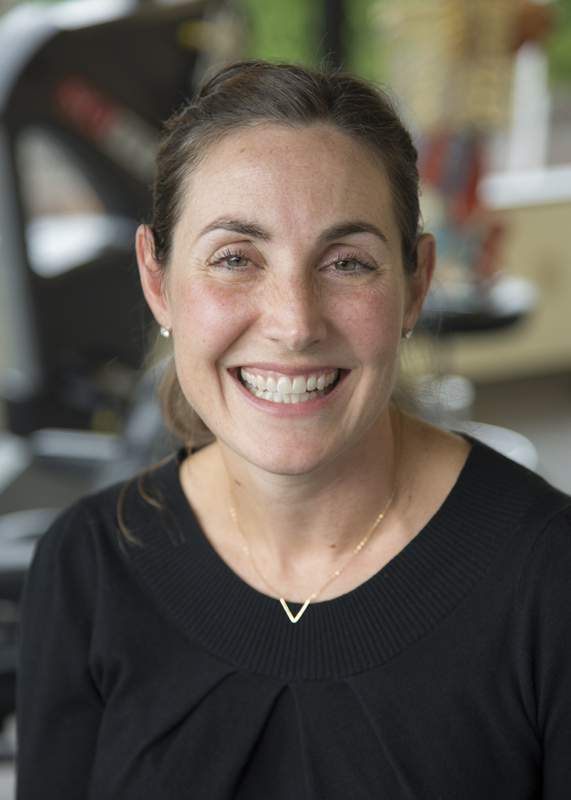 She began specializing in Women’s Health Physical Therapy in 2010 and continues to expand her expertise through the Pelvic Rehab Institute, originally founded by Kathe Wallace, PT, BCB-PMD, and Hollis Herman, PT, DPT, MS, OCS, WCS, BCB-PMD. She is trained in intravaginal manual treatment and the care of patients during pregnancy and post partum. She is a member of the Women’s Health Physical Therapy and Orthopedic Sections of the APTA. Brie is dedicated to providing comprehensive care to her patients to allow them to be healthy and maintain improvements long after finishing physical therapy. She enjoys helping patients discover their own unique needs and goals and providing them with the tools and knowledge to reach them. Outside of work, Brie enjoys spending time with her husband and two very active sons exploring, hiking, swimming, skiing, and running. 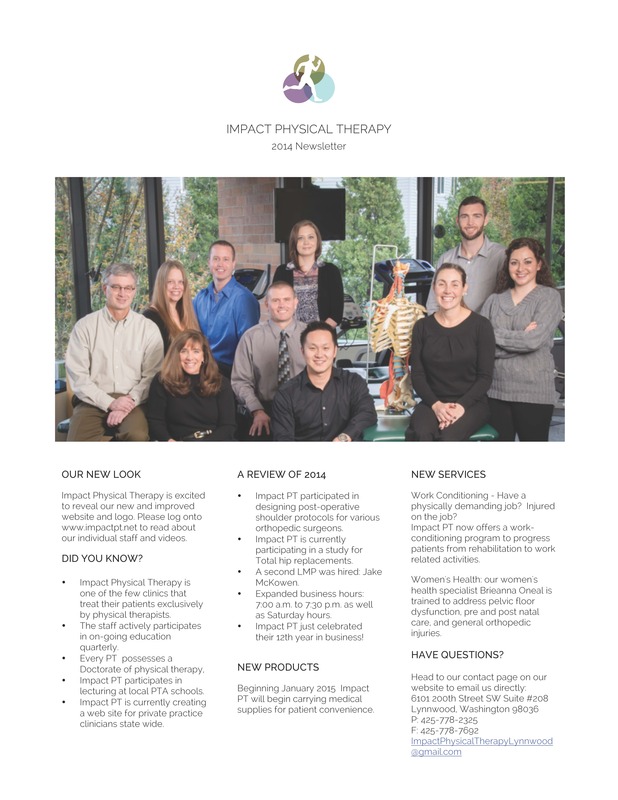 Happy New Year from Impact Physical Therapy! Check out our 2014 Newsletter to find out what we’ve been up to the past year and what we’re looking forward to in 2015.